Hurricane Watch Issued For Gulf Coast [VIDEO] - Joe.My.God. 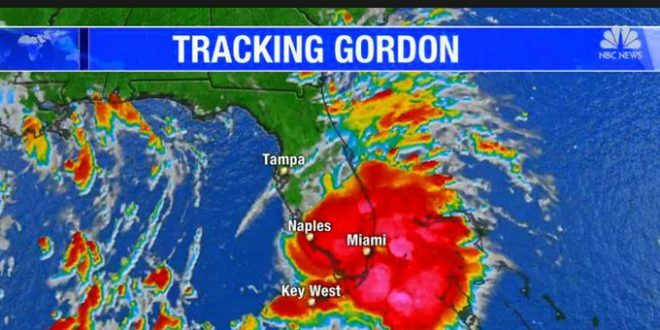 Tropical Storm Gordon is pushing into the Gulf of Mexico as it continues to bring heavy rain and gusty winds to Florida. Gordon will head for a northern Gulf Coast landfall late Tuesday as a strong tropical storm or possibly a Category 1 hurricane. The National Hurricane Center has now issued a hurricane watch from the mouth of the Pearl River, Mississippi, to the border between Alabama and Florida. A hurricane watch means hurricane-force winds (74-plus mph) are possible in the area indicated beginning late Tuesday or Tuesday night. Tropical storm warnings are posted for South Florida, from Golden Beach on the southeastern coast to Bonita Beach on the southwestern coast, as well as for the Keys, from Craig Key to Ocean Reef.